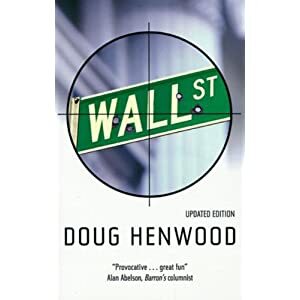 I recently read the book Wall Street – How it works and for whom – by Doug Henwood. This book can be downloaded (for free) from its website. 1- Instruments: This chapter covers the range of instruments traded on Wall Street, such as stocks, bonds, derivatives, currencies etc. 2- Players: This chapter covers the main stakeholders including households, nonfinancial business, financial institutions, the government etc. 3- Ensemble: This chapter discusses how the markets are intertwined, with a focus on credit, finance and the economy, allocation etc. It also includes a sample trading week to put these concepts into action. 4- Market Models: This chapter presents the numerous financial models that have been devised to simulate the market. It also discusses features of these markets, namely efficiency, disinformation, noise, fads, and bubbles. 5- Renegades: This chapter discusses in detail the Keynesian view of the markets, as well as those of Marx. 6- Governance: This chapter is about Corporate Governance, with a section on the relation of Wall Street and the government. 7- What is (not) to be done? : This last chapter includes the author’s thoughts on a number of economic issues such as social security, the Fed, investing socially, taxation, corporate transformation. The breadth of topics discussed within this book is commendable, backed by a plethora of references for further reading in areas of interest. Chapters 1 and 2, serve as a great introduction and primer on the financial markets. The insight, stories and practical example presented make this book accessible. A final, and important comment to keep in mind, is that the author presents the content of the book (particularly the later chapters) from a leftist perspective.